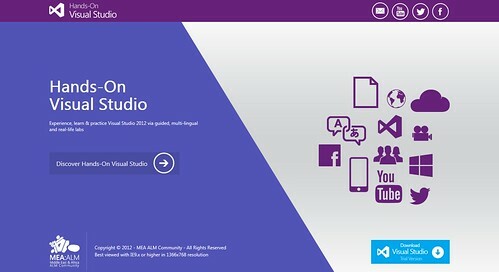 HandsOnVisualStudio.com is a website that we (MEA ALM Community) created based on Brian keller’s Virtual Machine and HOLs to experience, learn & practice Visual Studio 2012 via guided, multi-lingual and real-life labs. I'm TFS/ALM Consultant, Agile Associate and Speaker, I love Innovation and Microsoft Team Foundation System because it's the best system for ALM (Application Life Cycle Management). I'm interested in anything related to AGILE because I believe it's the best way for making software. Hope you enjoy my blog. This entry was posted in ALM, MEA ALM Community, TFS2012, Visual Studio 2012 and tagged HandsOnLabs, MEAALM, TFS2012, UserVoice, VS2012. Bookmark the permalink. What’s New in Visual Studio 2012 – Update 2 RTM Release? Test Impact (Data Adapter) – Makes tester life easier.